Living a Fit and Full Life: Investigate Everyday Situations with Mily Miss Questions: Season 1 from NCircle! + Giveaway! Investigate Everyday Situations with Mily Miss Questions: Season 1 from NCircle! + Giveaway! "Join Mily, a funny and inquisitive 8-year-old girl, as she embarks on adventures hoping to answer the many questions she has about life, people, and the world. In this collection of twenty four episodes, join Mily and her friends as they investigate everyday situations from learning how to deal with fear to playing by the rules to using your imagination and so much more. Whenever a particular situation raises a question worthy of examination, Mily is immediately on the case! From one episode to the next, through everyday situations, Mily introduces young viewers to the art of questioning in order to further develop an inquisitive mind." Investigate everyday situations with Mily Miss Questions: Season 1 from NCircle! 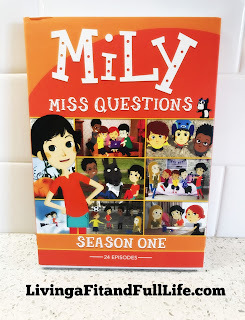 Mily Miss Questions: Season 1 from NCircle is a super fun DVD for kids! 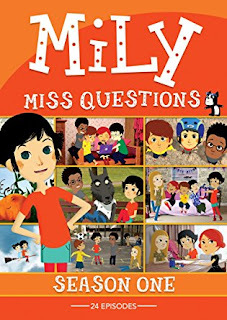 My 7 and 9 year old daughters absolutely love Mily Miss Questions and I love how well it entertains them. I also love that Mily Miss Questions: Season 1 from NCircle helps kids investigate everyday situations. My kids are incredibly inquisitive so Mily Miss Questions: Season 1 from NCircle is right up their alley. Mily Miss Questions: Season 1 from NCircle is the perfect way to relax after a day of play!